As Friends of the Chicago River Ecology Outreach Manager Mark Hauser likes to say, "The river's the best classroom in the world." 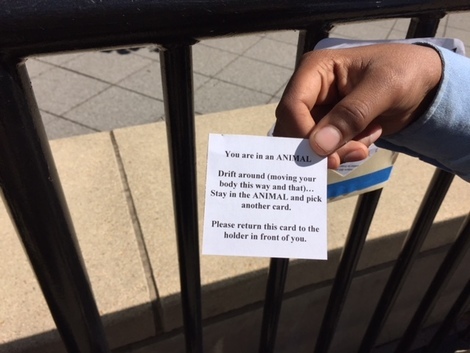 On a recent weekday in early September, for students from Chicago Jesuit Academy, that was certainly the case. 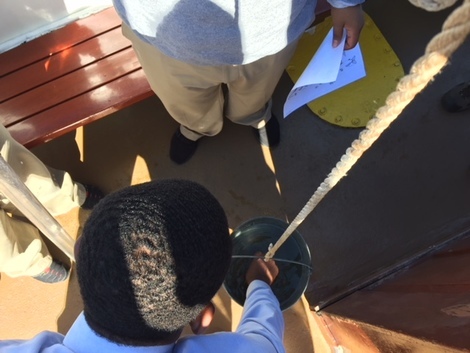 About a dozen 8th graders from the west side Austin neighborhood school took to the river via a Chicago Line Cruises boat to get some hands-on schooling on water issues from Hauser and School of the Art Institute of Chicago Professor Linda Keane. 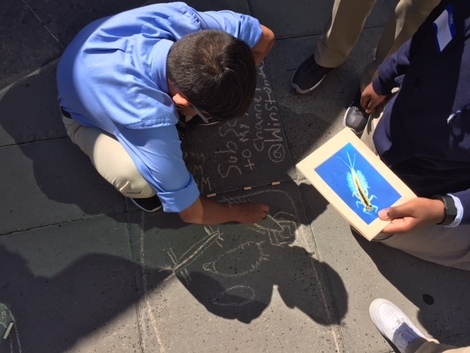 Thanks to support from Chicago Community Trust and Hive Chicago, the students were able to take advantage of Friends' Chicago River School Network, which reaches thousands of students per year and uses the Chicago River system to teach about the history and ecology of the waterway. Students tested the water for dissolved oxygen (how much O2 is available for fish and other aquatic wildlife); phosphates (fertilizer and industrial soaps); nitrates (ferilizers); pH (acidic vs. basic); turbity (suspended solids); and dissolved solids (salt, heavy metals) from the Main Stem, the North Branch near Groupon, and the South Branch near Ping Tom Park. Hauser explained how Friends has partnered with the Illinois Department of Natural Resources to add a quarter million catfish and 6,000 Northern pike to the river system. Peering into the water over the side of the boat, one boy asked with an air of incredulity, "You mean there are fish in the river right now?" The students were amazed, too, by the engineering required to reverse the river. Water conservation was a key message, with Keane explaining how the Great Lakes contain 21 percent of the planet's surface freshwater. With fresh water at a premium, "water is the next oil," she said. 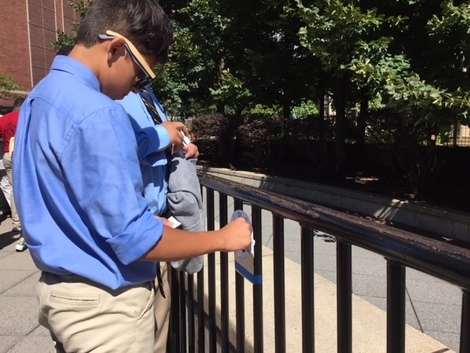 Chicago Jesuit Academy describes itself as a full-scholarship lower and middle school "for young men from modest economic backgrounds who could not otherwise access a well-resourced, faith-based college prep education in the Catholic tradition." 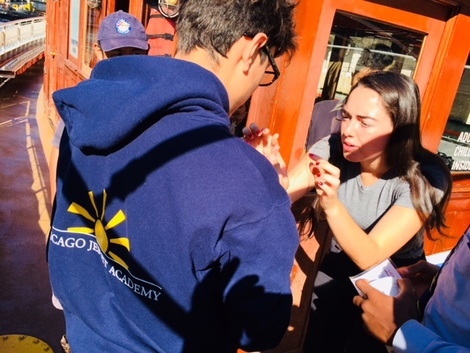 Founded in 2005, Chicago Jesuit Academy features small class sizes, extended school days and an 11-month school year. Accompanying the group on the river trip were science teacher Meredith Schmitt and school nurse Pam Gilmour. School of the Art Institute of Chicago Professor Linda Keane and Friends of the Chicago River Ecology Ootreach Manager Mark Hauser talk about the shoreline of the Great Lakes. 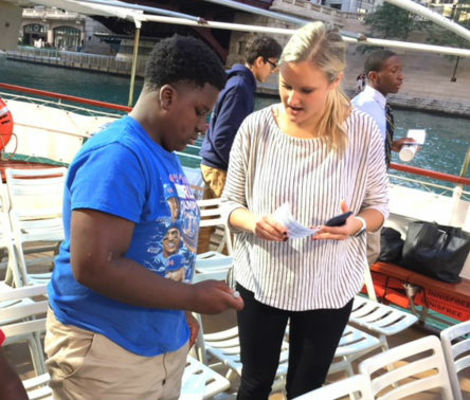 Chicago Jesuit Academy science teacher Meredith Schmitt works with a student on a water quality testing project. 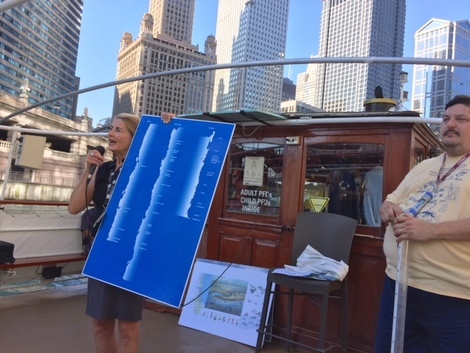 Friends of the Chicago River intern and DePaul University student Gabrielle Francis explains the science behind water sampling. 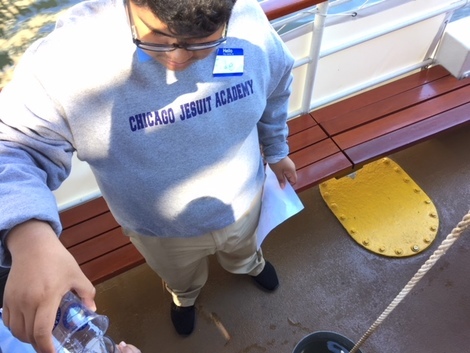 A Chicago Jesuit Academy student pours water into a testing kit with his science partner. A bucket was used to grab some river water and bring it on board. 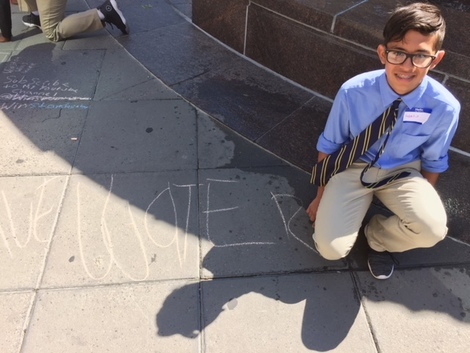 After the boat trip, the students moved to the Nicholas J. Melas Centennial Fountain on the north bank of the Chicago River at McClurg Court for some game-like exercises that helped them understand the breadth of the Chicago River system and its ecology. 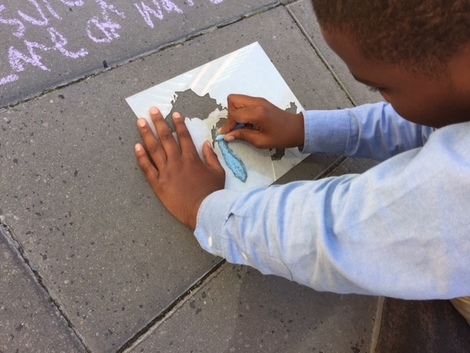 Students were given chalk to illustrate what they learned. You can't believe what lives in the Chicago River! H.O.M.E.S. : Huron, Ontario, Michigan, Erie, Superior.